Photospeak;When the Governors of Lagos Met! Fashola,Ambode and Sanwo-olu! Well you might argue that Sanwo Olu isnt Gov just yet,but we all know it is kinda settled with the powers from Bourdillon. 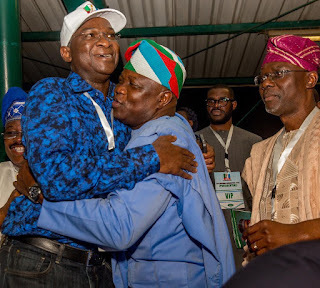 So Here's my imagination of what happened in this photo - Sanwoolu and Ambode discussing,Fashola steps into the arena and Ambode rushes to hug him tightly saying..
Sanwo olu looks on in his mind thinking,I better behave if not that would be me in 4 years! lol..
Nigerian Politics,simply game of chess!